This creamy sweet porridge is both filling and comforting, and adds an element of indulgent luxury to the morning routine! Porridge makes a good breakfast option. For many people, the fibre in oats is helpful for the digestive system, especially due to its ability to seemingly modify the gut microbiome (the trillions of bacteria living inside you!) This may for example help you manage your blood glucose levels better, which is good news if you wish to support your immune system. This porridge is made without milk, but the secret ingredient of creamed coconut means it’s very rich and creamy in texture. You will see that I’m recommending the same portion size of oats to pecan nuts in this breakfast. Doing so should help make it even more satisfying, but also moderate some of the effects of the deliciously sweet banana, that turns this porridge into such a tasty affair. Creamed coconut is an excellent store cupboard item. It’s the unsweetened dehydrated fresh meat of a mature coconut, ground to a semi-solid white creamy paste. It is sold in the form of a hard white block which can be stored at room temperature. You’ll find it in the supermarket alongside the tins of coconut milk, often in a small, rectangular cardboard box. This porridge is naturally sweet, but if you want it even sweeter you can add a drizzle (that’s just a little bit) of raw honey once it’s cooked. Raw honey (as apposed to pasteurised, regular honey) contains some interesting antioxidants, so is helpful for the immune system, was well as being antibacterial. For this recipe I’ve used cups as a way of providing measurements. I’m not a huge fan of weighing things out or counting calories, and in the morning who has the time to use scales? 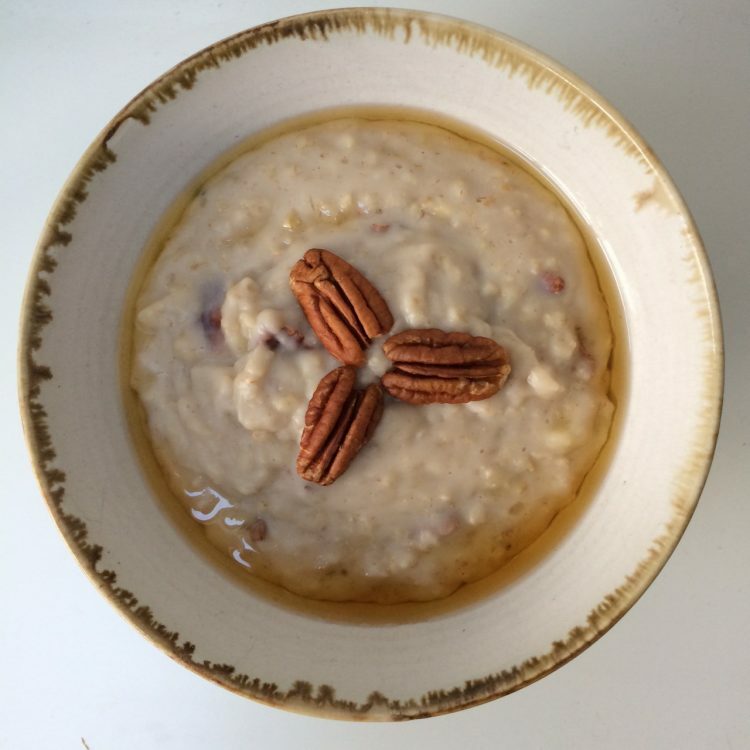 You may like to play around with the sizes to find what works best for you, but do remember to aim to keep the oat to pecan ratio at 1:1 if you can. Simply place all of the ingredients, except for the honey, into a pan and heat on the stove at a medium heat for 5-10 minutes, stirring throughout to ensure the porridge doesn’t stick to the bottom of the pan. Once creamy and thick, and the banana soft and sweet, transfer to a bowl and drizzle with a small amount of raw honey before eating.